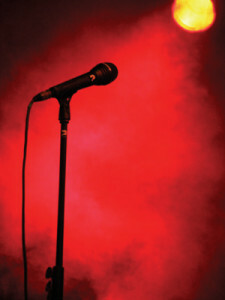 Stage fright is the name given to extreme anxiety about speaking, singing or acting in front of an audience. It is also known as Performance Anxiety. It can happen suddenly or can build up over time. Essentially the symptoms are those of anxiety, with heart flutters, dry mouth, feeling sick (or actually being sick) being the main side effects. If the person has had a bad experience before, it may hamper their attempts at doing it again, so we use the same fast techniques we use on phobias. This helps scramble the message of panic which comes from the subconscious. Then using relaxation techniques and visualisation it can focus the intellectual mind on the important task ahead. Other techniques such as yoga, meditation and mindfulness can help, as an exercise. It is helpful before a performance to go for a brisk walk, or any other brisk movements to get the energy and excitement out of one’s system. After that, try moderate stretching and calm and relax the muscles to release tension. Take deep slow breaths – the body interprets the big sigh as an all-clear signal. Not only can I help people with the problem once they’ve taken hold, I have been able to work through various organisations such as Connexions South West to work in schools, helping pupils relax and visualise positive outcomes when it comes to performance or interviews and teaches them stress management techniques. BWRT is a very fast paced tool, unlike hypnosis. once you can identify the fear that stops you and rate it a 10 out of 10, we use rapid visualisation to replace the bad experience with a preferred one. Once we can get the scoring down to 0, the person finds it almost impossible to access the scary thoughts. Gail is a friend and expressed her problem of wanting to sing in public but not liking people looking at her, so she hid behind her piano. This was not a helpful tactic. Using the rewind and visualisation techniques, I helped her change the way she had thought about the performance. Instead of being violently sick before a show – which happened once before. She was able to go on stage and perform with no problems at all. Afterwards, she was amazed at how different the experience had been to previous ones. This encouraged her to book herself in for more performances. 2 years later she announced she was going to stage school in London. She now regularly appears in front of the public and she says she could not have done it without the hypnotherapy. Whilst training, she realised she was having problems memorising the lines, again, explaining how memory is consolidated during sleep, I gave her another CD to listen to and suggested not staying up so late. The improvement in sleep helped her memorise her lines much better. Sandra is a teacher. She had changed her job to one where she had to do more presentations within the educational establishment. Despite having stood up in front of children for years, she found this challenging. She was paralyzed with fear because coming up in 3 weeks she had a big conference. We worked on the anxiety. Rewinding the bad experiences she’d had and visualising how she wanted to feel. The result was she went to her conference and was able to stand up and talk to a large audience without any hesitation. As a result of the work we completed, she was over the moon. This wasn’t an issue of being on stage but just answering questions during an interview. Cassey was having to go in front of a panel of judges for her new job. She was terrified after a previous experience had gone terribly wrong and she didn’t get her dream job. She realised that the more important the interview the worse her anxiety became. I explained that the subconscious wants her to know how important the interviews are. Conse, ently she perceives it as a threat. When accessing the terrifying ordeal she scored a 10, she was crying when she was describing how the interview went. By the end of the hour, she was a 0. She couldn’t access it at all. Not only that, she had to perform a talk in public to an audience in a book shop in London a few days later and she reported it went brilliantly.